Found only on the Galapagos Islands, the marine iguana lives mainly on the rocky shores, but can also inhabit the islands’ mangrove beaches and marshes. 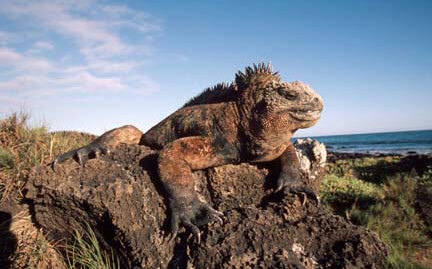 Surviving on a diet of marine algae, these iguanas can only spend limited periods of time in the cold sea. Upon emerging from the water, they must spend time basking in the sun to recover from their cold-induced sluggishness. During this time they are vulnerable to predators, such as non-native dogs and cats. Marine iguanas are also threatened by habitat loss.